Definition at line 176 of file sha.h. Hashes which derive from IteratedHashWithStaticTransform provide static member functions InitState and Transform. External classes, like SEAL and MDC, can initialize state with a user provided key and operate the hash on the data with the user supplied state. On Intel platforms the state array must be 16-byte aligned for SSE2. Definition at line 937 of file sha.cpp. 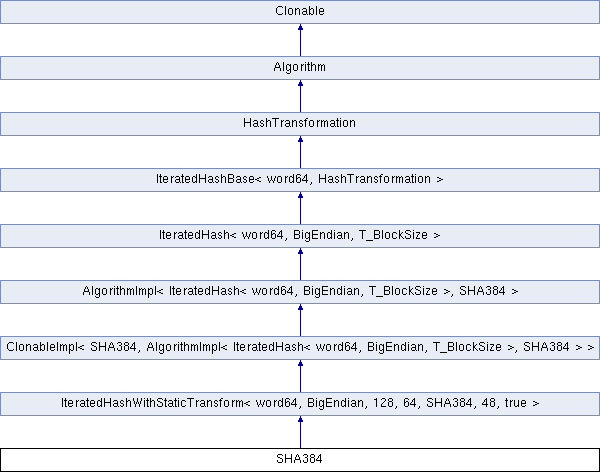 Transform operates the hash on data. When the call is invoked digest holds initial state. Upon return digest holds the hash or updated state. On Intel platforms the state array and data must be 16-byte aligned for SSE2. Definition at line 199 of file sha.h. Definition at line 202 of file sha.h. Reimplemented from IteratedHashBase< word64, HashTransformation >. Definition at line 927 of file sha.cpp.